On the first Saturday of October, we held a joint seminar with several members of the Virginia Kyudo Renmei. We had a great time being instructed by Bill (of the Virginia Kyudo Renmei) and by Mihasu (of Nagoya City University, Nagoya, Japan). During this seminar, a deliberate rhythmic timing to all of our movements during shooting was emphasized, as well as the specific distance that one's footsteps should cover within a given number of steps. In the afternoon, all the members were treated to Hitotsu Mato Sharei performed by Bill, Fumiko, Hideki, and Mihasu. Thank you very much! Everybody began the early weekend's training with terrific enthusiasm, and ended the day in good spirits. In the evening, the group dined at "Max's of Manila" in Jersey City at the recommendation of the NY/NJ Kyudo Kai's resident connoisseur [the food was indeed excellent]. 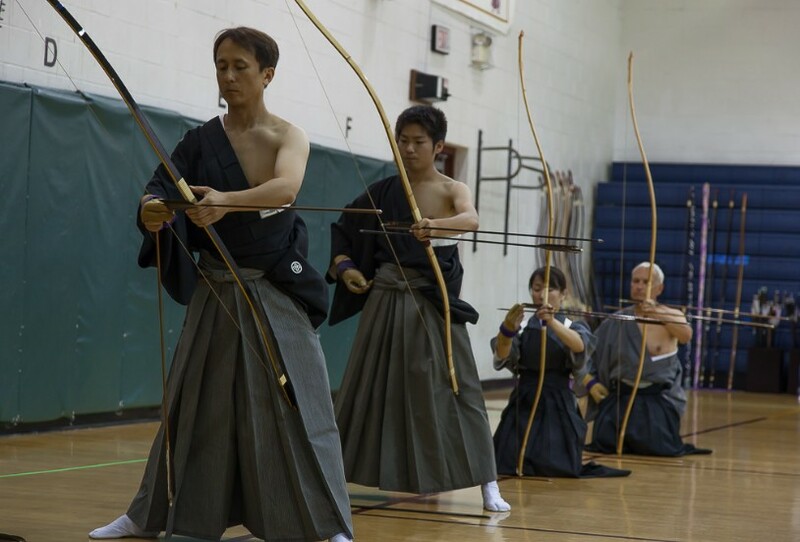 Thank you very much to the members of the Virginia Kyudo Renmei for attending! Thank you to everybody who helped out on the previous Friday evening to clean up the shajo. In addition, thanks to the school custodian who allowed us to make use of the school's cleaning supplies. This seminar could not have ran so smoothly without the good job everyone did on the cleaning. A special thanks especially to Bill and Mihasu for their fantastic instruction.